PHP is a recursive acronym that stands for “PHP Hypertext Preprocessor” (though it originally stood for “Personal Home Page” in 1995). It allows embedding code within HTML templates, using a language similar to Perl and Unix shells. It is parsed and executed by the Zend Engine on the server side. 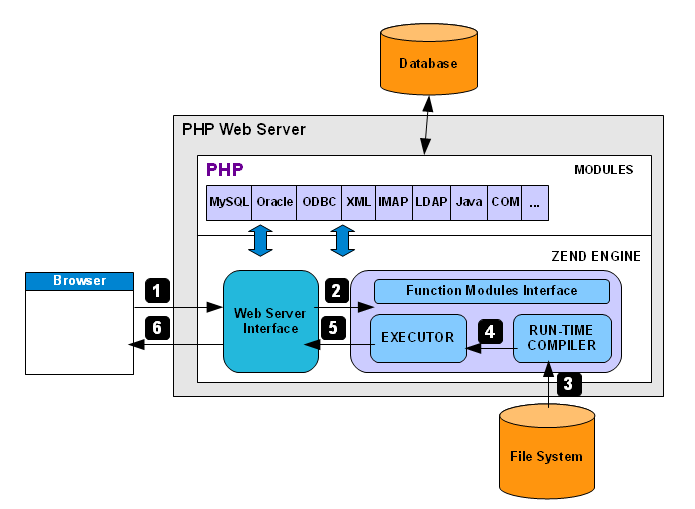 Now we are going to explain the most important modules of PHP web server shown in Figure 1. External modules can be loaded from the disk at script runtime using the function “bool dl (string $library)”. After the script is terminated, the external module is discarded from memory. Built-in modules are compiled directly into PHP and carried around with every PHP process; their functionality is available to every script that's being run. Memory Management: Zend gets full control over all memory allocations in fact it determines whether a block is in use, automatically freeing unused blocks and blocks with lost references, and thus prevent memory leaks. 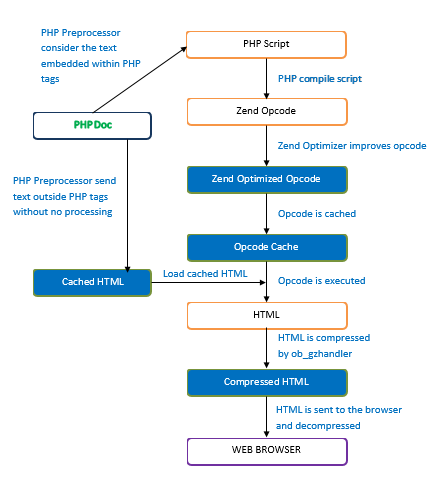 Zend Executor: Zend Engine compiles the PHP Code in the intermediate code Opcode which is executed by the Zend Executor which converts it to machine language. The script is run through a lexical analyzer to convert the human-readable code into tokens. These tokens are then passed to the parser. The parser parses, manipulates and optimizes the stream of tokens passed to it from the lexical analyzer and generates an intermediate code called opcodes2 that runs on the Zend Engine. This two steps which represents the compilation phase are provided by the Run-Time Compiler module as shown in Figure 1. After the intermediate code is generated, it is passed to the Executor. The executor steps through the op array, using a function for each opcode and HTML is generated for the same. This generated HTML is sent to client, if the web browser supports compressed web pages the HTML is encoded using gzip or deflate before sending. This opcode is flushed from memory after execution. 2 This intermediate code (opcodes ) is an ordered array of instructions (known as opcodesshort for operation code) that are basically three-address code: two operands for the inputs, a third operand for the result, plus the handler that will process the operands. The operands are either constants or an offset to a temporary variable, which is effectively a register in the Zend virtual machine. The .php file is pre-processed by the server considering the text embedded within “<?php ?>” blocks as PHP syntax, while text outside these blocks as arguments passed to “print” statements. The resulting output file of pre-processing phase is the following file.